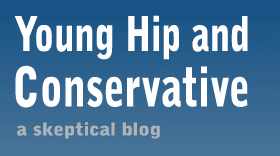 Young, Hip and Conservative: a skeptical blog: Really? REALLY? It was just announced that President Barack Obama won the 2009 Nobel Peace Prize for "his extraordinary efforts to strengthen international diplomacy and cooperation between peoples." While I don't support most of Obama's policies, I don't automatically criticize everything he does. Still, even I think this is award is completely underserved. Simply put, Obama hasn't accomplished anything yet. A quote from the CNN article puts it into perspective, in a great example of a statement that both sides can agree with. The committee wanted to be "far more daring" than in recent times and make an impact on global politics, said Kristian Berg Harpviken, director of the International Peace Research Institute. The Nobel Prize Committee wanted to "Make an impact on global politics" huh? Couldn't have said it better myself.